Pharmacy technicians or assistants are people that have the necessary skills to deliver high quality customer service and do inventory management at a pharmacy. Obtaining training in the field can provide lucrative opportunities for career establishment in a very competitive field. Many universities offer online pharmacy technician programs that are perfect for busy young professionals. They’re also great for the individuals that don’t have the means to attend a campus-based program. 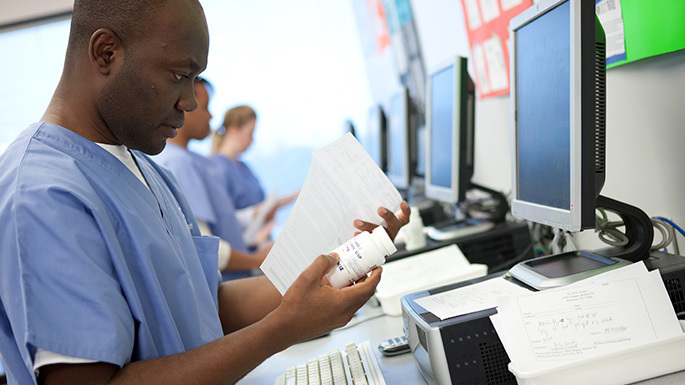 The online pharmacy technician program at Penn Foster Career School results in a career diploma that can be obtained in as little as nine months. Once this program is completed, students can move on to pursue pharmacy technician certification. The curriculum is quite diversified and it focuses on areas of study like basic chemistry of drug molecules, pharmacy arithmetic, pharmaceutical calculations, pharmaceutical dispensing, addictive drugs, adverse reactions and drug interactions, medical terminology and anatomy and physiology. Penn Foster Career School’s diplomas are both regionally and nationally-accredited. The program comes with one of the best price to quality ratios. Students can choose among monthly and annual payments – a flexible schedule that isn’t available in that many academic institutions. The total regular price is 759 dollars and the monthly payments are about 45 dollars per month. The 10-course online program at Sinclair Community College will grant graduates an advanced pharmacy technician certificate. The program consists of 30 to 32 credit hours and it can be completed within one year of getting started. Some of the courses that students can choose among include introduction to healthcare delivery, fundamentals of disease processes, medical terminology and pharmacy technician directed practice. Students that undergo the program will be fully-prepared to take the Pharmacy Technician Certification Board Exam. While most of the program can be completed online, there’s also a direct practice component that will have to be fulfilled. The cost of completing the program is 3,432 dollars for in-state students and 6,868 dollars for out-of-state students. Financial assistance options are available. Both online and hybrid learning options are available at North Central Missouri College. Students that complete the program successfully will receive an AAS pharmacy technician degree. The program can be completed in a two-year period. Some of the courses available online include human anatomy, basic medical terminology, human physiology, medical law and ethics, database concepts, pharmacy calculations and pharmacy practice. A mandatory pharmacy technician internship is a graduation requirement. Students that have some prior experience as a pharmacy technician may qualify for the university’s advanced standing program. This program will decrease the amount of time required to obtain a degree and the cost of the certificate. People interested in the North Central Missouri College pharmacy technician program should be prepared to spend 2,848 dollars (for in-state students) and 4,160 dollars (for out-of-state students). Ashworth College offers a pharmacy technician training certification program. Students that complete this program will be ready to take the National Healthcare Association ExCPT Pharmacy Technician Certification exam and the Pharmacy Technician Certification Board’s exam. The program consists of an online educational component and an externship that results in hands-on experience. The college has partnerships with pharmacies across the country, giving students numerous opportunities to test their theoretical skills prior to graduating. Through the program, students will learn more about professional ethics in the pharmaceutical field, standard techniques and procedures related to pharmacy operations, regulations imposed by federal and state laws, major drug classifications and drug dispensation. The program also focuses on the client service and administrative responsibilities of the pharmacy technician. Ashworth College’s pharmacy technician training certification program costs 759 dollars when paid in full. Monthly payment plans are also available.